"A life of passion happens when emotional nature meets a consuming vocation." Recently, I read a wonderful article in the New York Times written by David Brooks. The commentary was in regards to what Lady Gaga had to say when being honored by the Americans for the Arts organization. This composition rang true for me, when the author quoted Lady Gaga as saying: " I wanted to be a constant reminder to the universe of what passion looks like. What it sounds like. What it feels like." Mr. Brook's continues by using words that describe my feelings, when he writes about passion in this way. Passion is an "Unquenchable thirst to find some activity that can be pursued wholeheartedly, without reservation." I have found that passion, it is grounded in innovation. Perhaps, like other creative souls, "I am driven by some glorious fantasy to make a mark on the world". But I think, I am just infected by a fervent curiosity and a need to share. Read on and learn about inspiration and my vocation to help others "Just Be Fearless." If you would enjoy reading David Brook's entire article please click here. 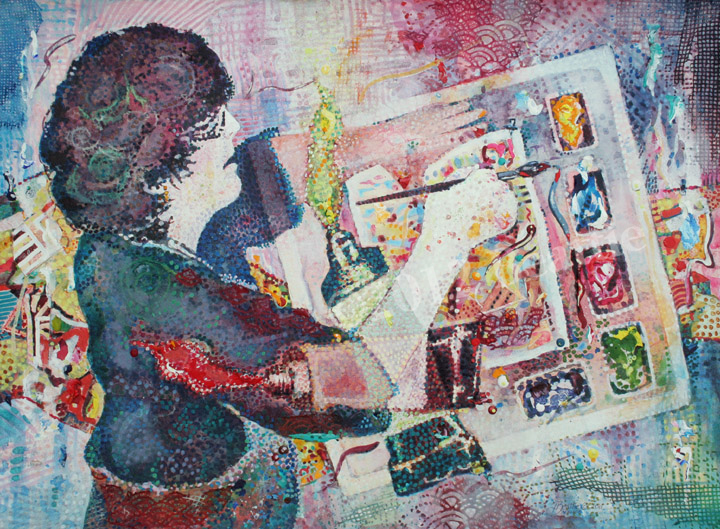 I chose a long time ago to live a life of passion, dedicated to the arts and helping others be creative. Every day, you can find me in my art studio fearlessly exploring new ways to express myself . I live a life, steadfast in my desire to learn how to "just be". My definition of "just be" is to follow a creative path, as Robert Frost once penned " The road not taken" "the one less traveled by." To read the whole poem by Frost please click here. Creative, Inspired, Fearless or Just be You! Whether you are interested in working with watercolors, acrylics or learning about pouring mixed media my goal is to share how to just be more Fearless with your art. Would you like to learn more about how I can help you be a fearless artist? Would you enjoy a painting vacation in Acadia, Maine, while studying unique,artistic techniques? Would you like to learn how to turn your photos and watercolor sketches into dynamic paintings using mixed water media? You are invited to join with me and learn more about how to "Just be a Fearless Artist".Travel with me and take your painting skills on an adventure! In my newest Fearless Painting Workshop "By Land or By Sea!" 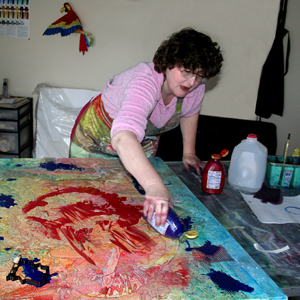 This four day adventure with paint will be July 11- 14,2016 at the Acadia Workshop Center. click here to contact Gail Ribas - director of the Acadia Workshop Center to reserve your spot to become Fearless! 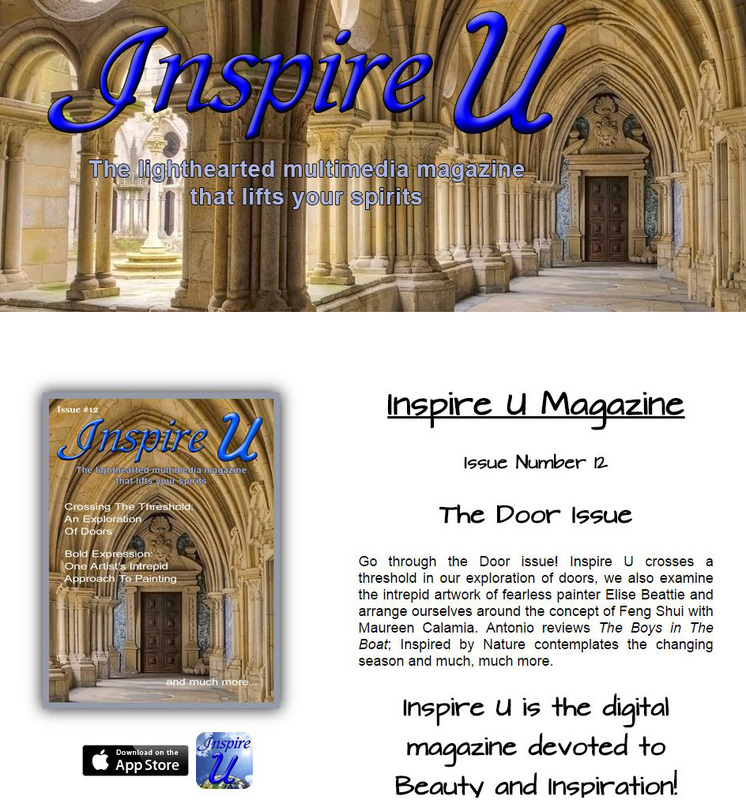 Recently I was invited to be the featured artist of a wonderful on-line magazine App called "INSPIRE U MAGAZINE". "Go through the Door issue! Inspire U crosses a threshold in our exploration of doors, we also examine the intrepid artwork of fearless painter Elise Beattie and arrange ourselves around the concept of Feng Shui with Maureen Calamia. Antonio reviews The Boys in The Boat; Inspired by Nature contemplates the changing season and much, much more." 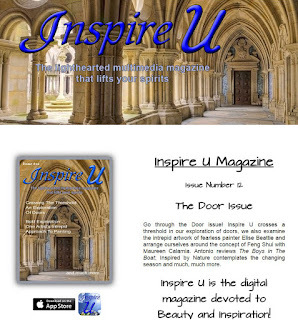 To read more & order your copy of Inspire U please click here. My friends at Inspire U have also put together this lovely video about my art. You can find this video on YouTube or click here to enjoy my "Bold Expressions". I am! So much so that I have a new painting to share with you. Here is a work that is about being me. My tools and inspiration are central to how I lead life. Ideas pop up from my imagination. These colorful designs leap over each other to find expression through brush and paint. Yes, this is me. This is my inspiration central where fearless techniques and imagination depart from. Next week is Thanksgiving, a special day because this is the time when I want to say thank you, to all of my friends & family who generously support my creative endeavors and share my thoughts. May you all have an enjoyable, peace-filled and creative holiday.